When Jesus' disciples had come together on the mountain, they asked him, "Lord, will restore the kingdom to Israel now?" Jesus said to them, "Don't worry yourself with the schedule that the Father has set according to his own will. Instead, know that you will receive power when the Holy Spirit has come upon you; and you will be my witnesses in Jerusalem, in all Judea and Samaria, and to the ends of the earth." When he had finished speaking he was lifted up before their eyes and disappeared behind a cloud. The disciples stood around waiting to see if he'd reappear and thinking that perhaps they should wait just a little longer when suddenly there were two people standing among them in white robes. These two said to them,"Why do you stand looking upwards? This Jesus--your Lord--has been taken up from you into heaven. He will come again in the same way that you just watched him go. So, when they had been given their mission and a new understanding of their calling they returned to Jerusalem. When they had entered the city, they went to the room where they had been staying. The eleven remaining members of the twelve--for Judas had taken his own life in remorse for his betrayal of their Lord--were all there and they must have felt not only the absence of their Lord but also the absence of their friend Judas. Those of the twelve who remained, Jesus' brothers, and several important women--including Mary the mother of Jesus--devoted themselves to one of the things that Jesus had been devoted to: prayer. After a little while, Peter--the one who had denied Jesus, had been reconciled with a calling to feed Jesus' sheep, and would eventually become a martyr--stood up among the disciples gathered there (there were approximately 120 there) and said to them, "Brothers and Sisters, we all know what happened to Judas. He went out and took his own life in the field that his blood money had purchased. We all know that nobody owns that field of blood, now. It was terrible but it had to happen because it was part of God's plan and it had been foretold by the Holy Spirit through David. Yes, he was one of us and he shared in our ministry but he became the guide of those who arrested our Lord. Remember that it is written in the psalter: 'Let his homestead become desolate, and let there be no one to live in it' and 'Let another take his position of overseer.' So one of the disciples who have been with us throughout our Lord's time among us must become a witness with us to his resurrection. One of Jesus' disciples must help us fulfill this new calling he has given us. It must be one of the disciples that was with us from the time John the Baptizer baptized Jesus. This person must have been with us until Jesus was taken to be murdered." So two men were suggested: Joseph called Barsabbas--who was also known as Justus--and Matthias. The disciples prayed, "Lord, you know everyone’s heart. Show us which one of these two you have chosen to take Judas' place in this ministry. Judas turned aside from your will to work his own will. Show us the one who will become an apostle in his place." And so they cast lots to determine which of the two men would take Judas' place and the lots indicated Matthias. 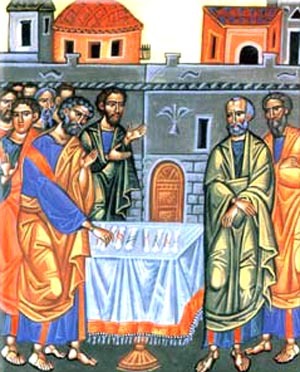 With unanimous agreement, Matthias became the thirteenth member of "the Twelve." He would go on to live a life much like the other apostles even dying a martyr in later years. He would devote himself to his calling--Jesus' calling--even if he wasn't one of the original twelve. He was aware of the need and was willing to play his own role in the grand story of the Faith.